In this section you will find comments and reviews on the different pomades we’ve tried out. It is important to note that the bulk of the pomades we will focus on are water based. These water based pomades are also known as “ringing gels”. It is true that the “traditional” pomades were oil based, as per the above definition of pomades. In fact back then, the pomade ingredient list may have been as short as; petroleum jelly and a scent. Things have come a long way since. The recipes are more complex and possibly healthier for the hair and scalp we are putting this goo on. Oil based pomades are still available and quite popular. If you go the oil based route, you will also require a slightly different range of shampoos to clean them out. Since an oil based pomades may take 2-3 shampoos to get it washed out with regular shampoos. On the other side, this is also one of the historical appeals of pomades – the goo stays active and you can simply comb and go. The same is true for water based pomades; wet a bit, comb and go. What kind of look would you achieve with pomades? As an easy reference, the men in the 60’s television show “Mad Men” are all wearing some variation of a heavy oil-based pomade. Another look is the 50’s greaser or Rockabilly, where the hair is short on the side and long on top. This is also best accomplished with pomade. In our opinion, water based pomade will do this best as the product is stickier, lighter and dries more than oil based products do. 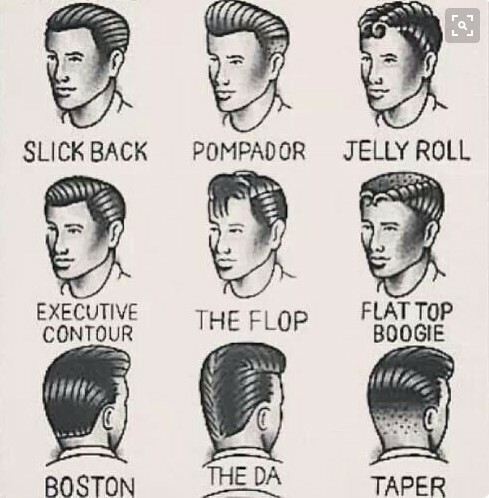 Why go to Pomade Avenue? Pomade as a whole is a very economical hair fixative solution. Most pomades are around $15 a jar. Obviously, there are numerous fancy options that will be more expensive, but you can find top notch products in that price range. Layrite is such a example. Secondly, a very small amount of product is needed to accomplish proper hair placement. Lastly, because of its “revivability” you can restyle your hair without necessarily using more product. That is certainly true of the oil based versions and true as well for the water-based ones. But for the water-based ones, you might benefit by adding a few drops of water to “revive” it. For the purpose of these pages, we are favoring the water-based concoctions.